Hex - The Legend of the Towers, was the new ride for the 2000 season. The theme of the ride is loosely set around a legend that dates back to the nineteenth century, where the Earl was travelling to the Towers, when a beggar woman approached the carriage, begging for money. After being disregarded by the Earl, the beggar placed a curse on the Earl, saying that every time a branch fell from the old oak tree, a member of his family would die. Later that night, during the opening of the new banqueting hall, a freak storm rolled over the Towers. Lightening struck the oak tree, and a branch fell. Soon afterwards, a member of the Earls family suffered an abrupt and inexplicable death. The next day, the Earl ordered the oak tree to be wrapped in chains so that a branch could not fall again. The ride itself, is really in two parts. The first part is really a continuation of the queue line, where you are shown a series of video clips. The secret vault is the real ride. In here are four rows of 20 seats, with two rows on either side of the centre piece, so that you are seated in a similar way as on Blade. 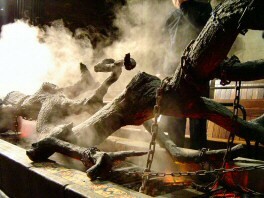 The centre piece, is a large branch from the Tree In Chains, that is chained to the floor. All around the room are various pieces of machinery and equipment. Once everyone is seated, the lap bars come down. The first thing you experience is quite strange. You get a distinct feeling of movement, yet nothing in the room is moving. Soon, the entire seating area begins to swing back and forth, in a Blade fashion, though not to the same height. The disorientation occurs at this stage. Your brain is tricked into thinking you are upside down, as the entire room revolved in the opposite direction. This really upsets your senses, as your sense of balance tells you, you are not upside down, but your eyes are telling you, you are. The ride settles down after a minute or so, and you then leave the ride through more passages, before emerging into the conservatory, and into the gardens in the Towers grounds.